This is the year of Rooster, 2017, according to the Chinese lunar calendar. As a native Chinese, spring festival is my favorite time of the year. People usually have winter vacations during this time, and spring festival is the time that families get together and relax. It is just like Christmas here in America. Although I can’t celebrate with my family this year, the student organization “Bridges the Internationals” has provided me a chance to welcome the Chinese new year. There were twelve of us here: all girls, some are graduating seniors, some just started the life in Iowa. We are from different parts of world: China, Korea, and America; we have different majors: accounting, business, pre-med, Literature, Engineering… But, we all belong to this big family called “Bridges to Internationals”, which connects international students and local Americans to provide a platform of making friends on campus. This is where we hang out, learn and grow together. I joined this student org when I was a freshman, and now I really enjoy the time with my friends in this community and have had unforgettable memories. 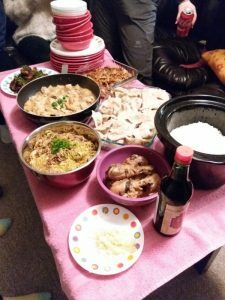 To celebrate the spring festival, it is typical that people will share a big meal together. This time, we got together and made dumplings and other creative dishes. Here is a photo of what we made! Homemade feast by Bridges the Internationals! Can’t wait to eat!